DIE Mercurii, videlicet, 27 die Aprilis, post meridiem. Message to the H.C. for a further Conference, concerning Hull. King's Printer to print the Votes about Sir John Hotham. 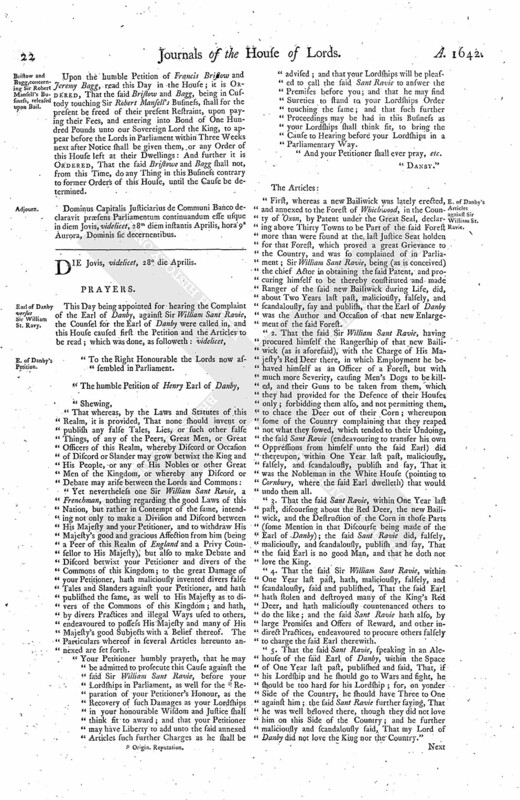 Bristow and Bagg, concerning Sir Robert Mansell's Business, released upon Bail. The Lord Chief Justice of the Common Pleas was appointed by the House to be Speaker this Afternoon. To desire a Conference, by a Committee of both Houses, in the Painted Chamber, at such Time as may stand with their Conveniency, touching the Conference Yesterday concerning Hull. The Matter of this Conference was to be, "To acquaint the House of (fn. 1) Commons of their Lordships Resolutions to the several Particulars of the Conference Yesterday, and what Directions are given to put them into Execution." That they will give a present Conference, as is desired. Ordered, That the King's Printer be commanded to print the Votes and Orders Yesterday Ordered to be printed and published; and that the same be sent to the Sheriffs of Yorke and Lyncolne. 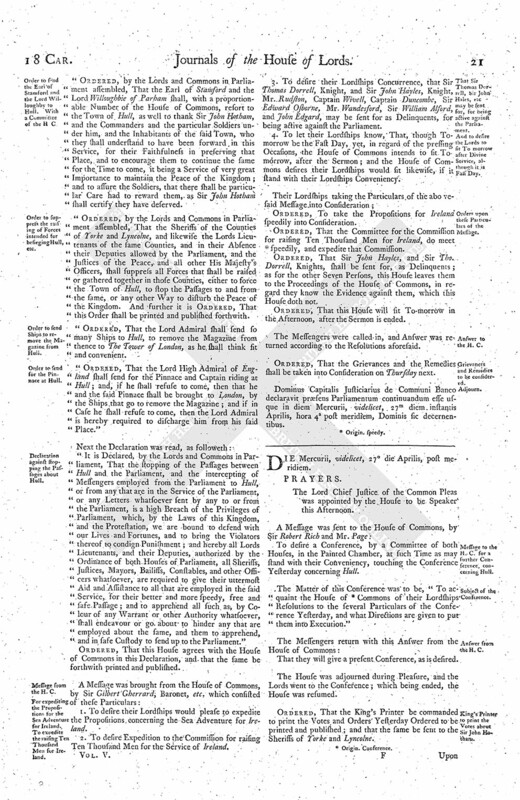 Upon the humble Petition of Francis Bristow and Jeremy Bagg, read this Day in the House; it is Ordered, That the said Bristow and Bagg, being in Custody touching Sir Robert Mansell's Business, shall for the present be freed of their present Restraint, upon paying their Fees, and entering into Bond of One Hundred Pounds unto our Sovereign Lord the King, to appear before the Lords in Parliament within Three Weeks next after Notice shall be given them, or any Order of this House left at their Dwellings: And further it is Ordered, That the said Bristowe and Bagg shall not, from this Time, do any Thing in this Business contrary to former Orders of this House, until the Cause be determined. Dominus Capitalis Justiciarius de Communi Banco declaravit præsens Parliamentum continuadum esse usque in diem Jovis, videlicet, 28m diem instantis Aprilis, hora 9a Aurora, Dominis sic decernentibus.